USCG personnel will open the lighthouse for tours on National Lighthouse Day, 8/7/18. There is no finer way to celebrate National Lighthouse Day than by climbing a lighthouse and basking in the beauty and history that abounds at the venerable guardians of the sea. The public can do just that at Owls Head Lighthouse on August 7th from 11 am to 3 pm. 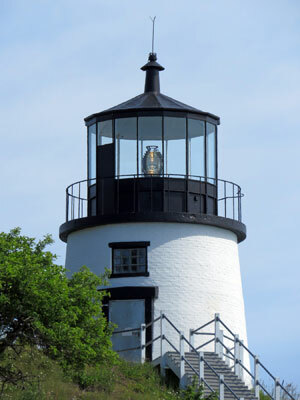 Personnel from the United States Coast Guard Aids to Navigation Team Southwest Harbor will be on hand at Owls Head Light that day to give tours of the 1852 tower and provide visitors with an opportunity to view the sentinel’s gorgeous fourth order Fresnel lens up close. The classical lens is a timeless work of art unto itself and a treat to see shining bright as a guide to mariners on Penobscot Bay. Visitors must be a minimum of 42 inches tall and have appropriate footwear to climb the lighthouse. National Lighthouse Day at Owls Head Light on August 7th promises to be fun for the entire family! After touring the light tower, be sure to stop in the keeper’s house where there will be coloring activities for kids, a collection of modern Coast Guard aids to navigation equipment to view, and a chance to shop for neat lighthouse and nautical merchandise. 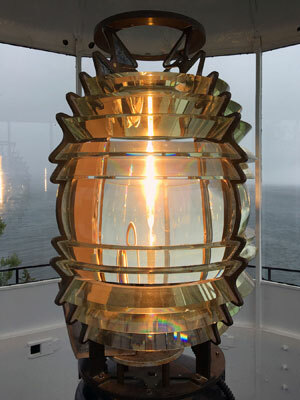 Owls Head is one of only eight Maine lighthouses to still possess a beautiful Fresnel lens. The nonprofit American Lighthouse Foundation, which cares for the historic buildings and grounds at Owls Head Light, encourages the public to stop by the station to learn why National Lighthouse Day is important to our nation. It was on this day (August 7) in 1789, that Congress approved an Act for the establishment and support of lighthouse, beacons, buoys and public piers. In Celebration of the 200th Anniversary of the signing of the Act and the commissioning of the first Federal lighthouse, Congress passed a resolution which designated August 7, 1989 as National Lighthouse Day. Since then, groups around the country celebrate our rich lighthouse heritage on this special date.